As a cheesemaker, Selina Cairns certainly has big wellies to fill. Her father’s, to be exact. Humphrey Errington is well known not only as a pioneer of Scotland’s artisan cheese movement, but as the man who fought and won a celebrated battle against environmental health officers who misguidedly tried to close down his operation. Now retired from active work, Humphrey has handed the head cheesemaking role to his daughter Selina, who with her husband Andrew run the farm. The pair have come a long way to their 300-acre farm in the foothills of the Pentlands, where they make a range of sheep, cow and goat milk cheeses. Although both are from farming stock, Selina had been a project manager at Edinburgh Airport, while Andrew was a civil engineer. And there’s still a fair bit of engineering to be seen in the farm’s new milking parlour, a cutting-edge system to replace the creaking equipment that dates back to the first on-farm cheesemaking in 1983. Their large flock of Lacaune sheep (which are crossed with Friesian) are milked twice a day, 32 at a time, with the new equipment measuring almost everything about the ewes’ individual milk production habits. 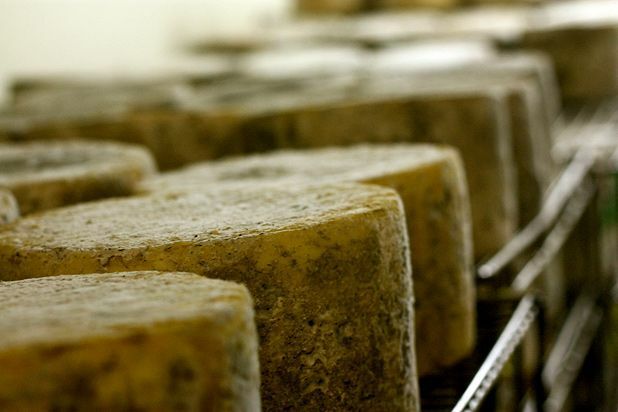 Their milk goes directly to the adjacent cheesemaking parlour, where it’s turned into the well-known Lanark Blue, the lesser-known Lanark White and the most recent addition to the range, Cora Linn, a harder, non-blue ewes’ milk cheese. Cheese making here is a family affair. Among the well-practised hands adding rennet, stirring and scooping, draining and pressing, wrapping and turning, and all the other steps that transform milk into cheese, is Selina’s sister-in-law, while at least one of the other four cheesemakers is following in his father’s footsteps. Together, the team produces 50 tonnes of handmade, unpasteurised cheese every year. And when the cheese is finally ready to be wrapped in its very distinctive packaging, there is one final family touch: the beautiful illustrations on the wrappers were created by Tom Errington, Selina’s uncle. For Dunsyre Blue, the cheese they produce most of, the milk comes from cows on Kirklands farm nearby, collected every morning in their tanker and pumped straight into the big stainless-steel bath where the process of heating and turning fats into proteins begins. For Biggar Blue, the goat’s milk cheese carrying the Errington name, the raw material comes every two weeks from Armstrong Dairy’s 200 goats. It’s a supply relationship that started with an SOS call when a surplus of goat’s milk flowed from a cancelled order. Selina was reluctant at first to start making another cheese, but the response from customers was an overwhelming ‘more please’ and it has become a regular fixture. Talking to Selina and Andrew Cairns in their farmhouse kitchen over tea and cheese (naturally), they are clear about their plans for the future. Their main ambition is to increase the farm’s sheep milk output by swapping regular commercial sheep for up to 75 per cent more ‘milk sheep’, and thus produce more of a cheese that regularly sells out: the Lanark Blue. There are a couple of other tasty ideas knocking around too – like a hard cheese steeped in single-malt whisky that could be a perfect addition to the Christmas cheese board. Clearly, the Errington tradition is in good hands.